I’ve been a little busy these days and have not been following a lot, but someone posted this on Facebook (thanks Barry Rueger). This article is primarily quoting Canwest and Mcleans. This is something we should keep our eyes on, I think. If there is any chance for public input, we should all take advantage. Having a private CBC would not be in the interest of Canadians. First of all, the Broadcasting Act specifically states that the system should be comprised of private, public, and community elements. The CBC is the only broadcaster in the public sector in Canada. So selling it off could mean that the government would be breaking the law. And of course, it would almost certainly mean a change in the content. I don’t know all the implications of having a privatized National Arts Centre or VIA Rail, but I’m thinking there would be more harm than good for all Canadians. So, as Paul Wells said, “now, don’t get too excited.” But just keep your eyes open. Will Tories sell the CBC? On Friday afternoon, when no one was paying attention, the Canwest newspapers broke a big story: The Harper government is considering selling off the CBC, the National Arts Centre, and VIA Rail. They’re not the classic privatization candidates, where you sell and walk away,” said Vining, an expert in Crown corporation privatizations. Unless, of course, you’re prepared to fully withdraw from the public purpose (of the Crown corporation). Certainly, the sale of a flagship Crown asset such as the CBC would be politically controversial. Now, don’t get too excited. Andrew Mayeda’s story is careful to point out that there is, as yet, no plan to put the NAC or the Corp on the block. He seems to have got his hands on a departmental survey of all saleable assets. And it’s less glamorous Crown properties that are listed above the blue-chip properties Andrew mentions in his lede. It’s entirely possible for the feds to reject a sale of these marquee assets, or indeed of any assets at all. But Paul Dewar, the NDP MP who gets quoted in the Sun story above and has archived it on his website, is right. The feds are not only airily mulling an asset sale in the abstract, they’ve booked revenue from it in this budget year, and in succeeding years, to the tune of many billions of dollars in total sales. When Dewar quizzed Jim Flaherty about it three months ago, Flaherty was nonchalant in acknowledging, broadly, the premise of Dewar’s questions. There are really only two possibilities. The government can [sell] billions of dollars worth of stuff, or its deficit can be billions of dollars higher. On Friday evening, The Hook found no responses yet from Friends of Canadian Broadcasting, Inside the CBC, J-Source, or CBC News. “If you’ve got something to contribute to this discussion, then we want to hear from you. We are looking for articles, essays, investigative reportage, news briefs, project profiles, interviews with luminary thinkers, reviews, poetry, humour, artwork & photography that explore how we can unplug from the growth machine and cope with the global recession. “We seek to cast a broad net in our approach, profiling initiatives in energy alternatives, housing and urban planning, transportation, job (re)training, ecological economics and much more — this is not an exhaustive list! If you are not familiar with Adbusters and care about the “erosion of our physical and cultural environments by commercial forces”, find out more now. But Nothing Day was born in 1992 and adopted by environmentalists, but has since grown into an international campaign. 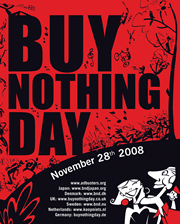 And this year, Buy Noting Day is looking at the current economic crisis. Ottawa cuts funding to Festivals – Take ACTION Now, It Can Work! Take ACTION Now! Stop the Cuts! The City of Ottawa proposes to cut 100% of funding to arts festivals in Ottawa. This will adversely effect such festivals as the Writer’s Festival, Jazz Festival, Ladyfest, and many others. Similar cuts were proposed in 2004, and were stopped by a campaign called “My Ottawa Includes Culture.” The only thing that will stop these draconian cuts is a huge public outcry to city hall. Here is a link that will allow you to give direct feedback to the City of Ottawa about the proposed 100% cuts to festival funding. All you have to do is click, add your name, and send the form. Please pass it around. Here is a link to a sample letter about the cuts, with links to city councilors. Please send emails to city councilors, and pass on the link to anyone who might wish to take action. “There is an opportunity to speak at City Hall (instructions attached) on Dec. 2 or 3 if you want to be part of a public delegation. To book a time, you have only to phone and make arrangements.